The white and waxen dead! HIRST, H.B. (1845): The coming of the Mammoth and other Poems. Phillips & Sampson, Boston. The recognition of at least 5 major mass extinctions (excluding the recent one, where we well know the cause) in the history of life led to many speculations and hypothesis by naturalists - all sorts of geological and biological phenomena were cited as cause. The best studied extinction events are the Permian-Triassic transition, when nearly 90% of higher life forms went extinct, the Cretaceous-Palaeogene transition, when as most recognized victims the non-avian dinosaurs disappeared, and the extinction of the Megafauna at the Pleistocene-Holocene transition. Some of these hypotheses today sound strange: some where influenced by political and personal opinions of the respective authors, others claimed to explain all extinctions even if they dealt only with a particular event, others were very speculative and still expect acknowledgment. Let's start with the most recent extinction event - here some theories, from intriguing to weird, which claim to explain the demise of the Mammoths and the Neanderthals at the end of the last glacial maximum. Could a catastrophic eruption modify the climate and bring death to the last survivors of a dying breed? Could the reversal of the geomagnetic field have deprived earth from its shield against dangerous UV-rays? A new papers proposes the increase of irridation as one of the factors contributing to the demise of the Neanderthal-man. Was it a meteor or comet that devastated North America, and melted the ice-shield of Greenland, bringing a little ice-age to the globe? This hypothesis published in January 2009 raised a lot of media interest; however the idea was not supported by the chronology of the extinction of various species (ranging from various centuries to thousand of years) and later research could not replicate the discovery of impact evidence like nano-diamonds or microspheres in the sediments. The Austrian palaeontologists Othenio Abel (1875-1946) propose that the extinction of the cave bear was caused by the proliferation of a race of inferior individuals by lack of natural selection. Abel was a great palaeontologist, but with the establishment of the National Socialism in Germany he begun to sympathize with the racial pseudoscience promoted by the party, and this influenced also his hypothesis in palaeontology. ABEL, O. & KYRLE, G. (1931): Die Drachenhöhle bei Mixnitz. Speläol. Monogr. VII - IX, Wien. A research team of the University of New Mexico in Albuquerque adds a something different approach to the problem of climate change as extinction cause. SMITH et al. published a paper where they compared the production of methane of modern farm animals to extinct herbivores. Methane is a very effective green house gas. The research team observed in the geological record strong variations of the concentration of methane between the last glacial maximum, 18.000 years ago, and the Younger Dryas (13.000 years ago). Especially at the beginning of the temperature drop of the Younger Dryas the concentration of methane diminished considerable fast. The research team speculates that with the beginning extinction of large herbivores an important source of methane was removed from the climate system, destabilizing climate and environment end enforcing the extinction rate. The fast changes observed, faster than previously known variations, maybe are also related to human activity, disproving precedent research that excluded humans as triggers for the Pleistocene extinction. In 2006 a research on the pathological malformations of the American Mastodon (Mammut americanum) and bison bones gave to the hypothesis developed in the fifties of a disease-related large mammal extinction new support. A large number of geographically and temporal separated individuals showed signs attributed to an infection by tuberculosis. A recent example how lethal pathogens can be for an isolated population was observed on the Christmas Islands in the Indian Ocean. Human colonization and introduced black rats (Rattus rattus) in 1899 brougth as pathogen an unicellular parasitic protist (Trypanosoma) on the island. The endemic rat species (Rattus macleari) didn't possess a natural resistance against the introduced parasite, and the population suffered a rapid decline, in 1904 the species was considered extinct. The following environmental hypotheses identify climatic and subsequent environment change , and intrinsic response of the organisms, as the main causes of the mass extinction. KOCH, P.L. & BARNOSKY, A.D. (2006): Late Quaternary Extinctions: State of the Debate. Annu. Rev. Ecol. Evol. Syst. 37: 215-250. The Overkill-hypotheses attribute the main extinction cause to human activity, especially hunt and habitat destruction, but also introduction of new animals and diseases. In fact many animals got extinct when humans for the first time arrived on the respective continent; However often a large period of co-existence is observed, denying the idea of a direct "blitzkrieg" against endemic species. Archeological evidence for active and widespread hunting of large mammals like mammoths is rare, studied remains show that the most common prey were smaller animals, as the still existing bison or horse. Fig.2. 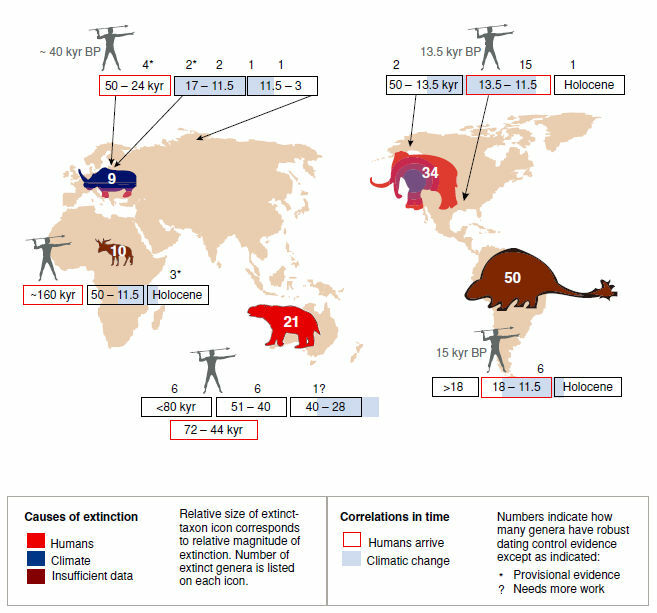 Chronology of the late Quaternary extinction, climate change, and human arrival on each continent. The timing of extinction for each genus was judged as robust or provisional based on previous publications that evaluated quality of dates. For humans, the earliest generally accepted arrival of Homo sapiens sapiens is indicated. Pre-sapiens hominins were present in Eurasia and Africa much earlier (KOCH et al 2006). Introduction figure from HUTCHINSON, H.N. (1897): Extinct monsters: A popular account of some of the larger forms of ancient animal life. Chapman & Hall, ld. London.